Well it is nice to win… unless it is something like this! Atlanta has been given the distinction as the worst city for weeds this next growing season. Let me tell you, as a landscape guy in Atlanta, this is a bummer. 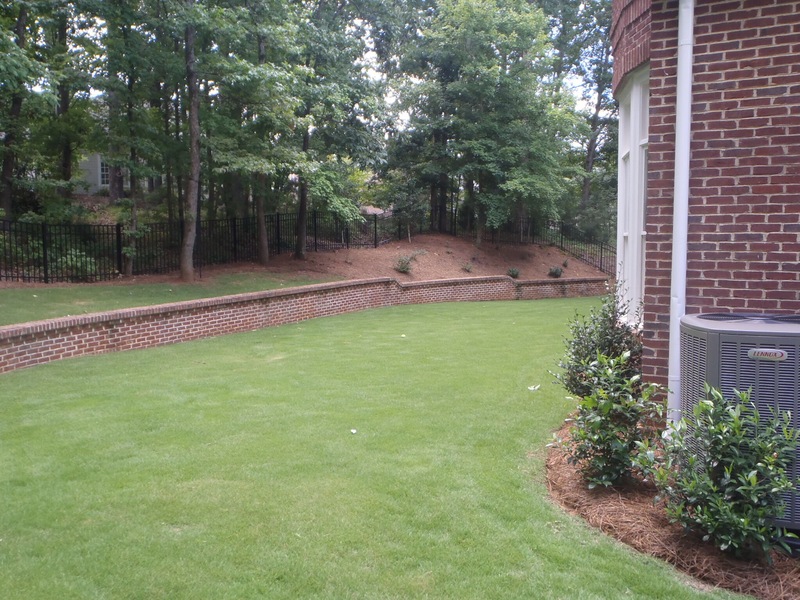 We have been noticing that over the last 8-10 years that managing turf in Atlanta has become more of a challenge. There are just so many issues that can come up given our climate and this spring looks to be as challenging as any we have seen. Hopefully we disappoint NALP and this distinction does not fall upon Atlanta and all of our turf loving clients! Time will tell but we do have a great program set for this season and if you see anything that concerns you with your turf, don’t hesitate to give us a call. http://scapesgroup.com/wp-content/uploads/2017/04/scapes_header_logo-300x131.png 0 0 x3creative http://scapesgroup.com/wp-content/uploads/2017/04/scapes_header_logo-300x131.png x3creative2018-04-17 15:55:102018-04-17 15:55:10Atlanta Wins! Its the worst city for turf problems! It can be very interesting to see information like this. Houzz just released their survey results from their most recent survey. The results don’t necessarily surprise us but it is interesting nonetheless. 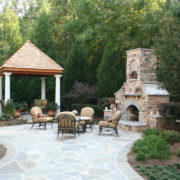 Let us know what you think, and if we can help you with your landscape project please let us know. 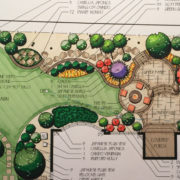 This is an interesting audio clip from Lisa Fiore, president of the Illinois Landscape Contractors Association. The discussion is about what they are doing in their area to combat the problem. We see this in the Atlanta area also and wish there were better ways to protect potential clients and our community from these “businesses”. We support a fair and competitive marketplace and support legitimate businesses as competition. There are just too many contractors out there skirting the rules. 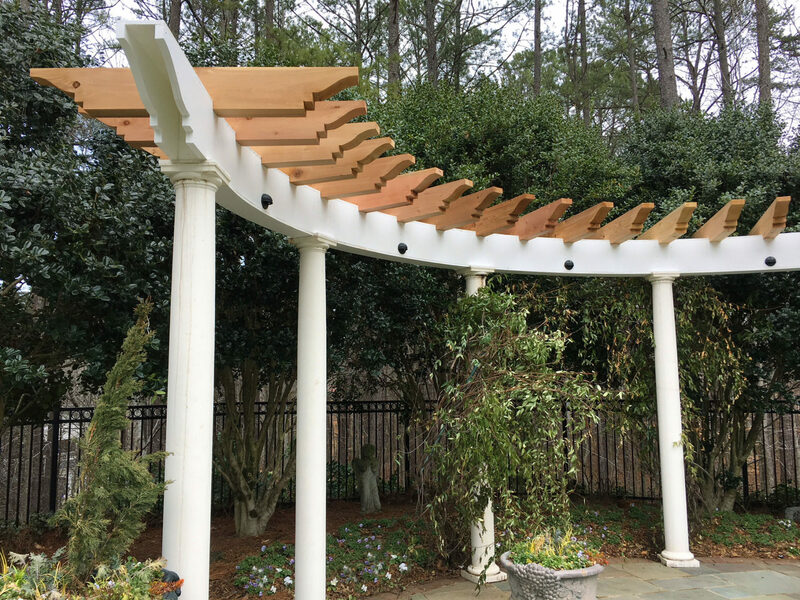 Given an opportunity to renovate an arbor from one of our award winning projects from 2002, we jumped at the chance to update the materials. 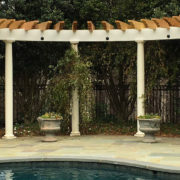 The original arbor top was made out of pressure treated lumber. It lasted for a long time and only needed occasional painting to keep looking new. Eventually the wood was just too tired to freshen up so we decided to rebuild the top of the arbor. Materials have changed a little in the past 16 years so we decided to rebuild the top in PVC. The look would be almost exactly the same. The durability and maintenance would be drastically different. The original low voltage lighting and posts were able to be reused and look as good as ever. 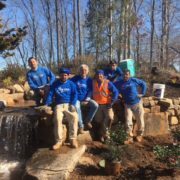 If you have a renovation to a once beautiful garden structure, or a renovation to an existing landscape, give Scapes a call. 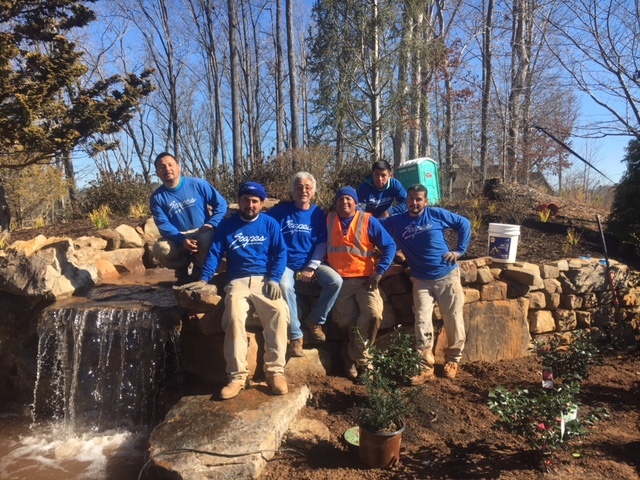 Just a quick update on what is happening in your landscape this month. The leaves are cleaned up and we are ramping up for Spring! If you have an event this month or would like a specific week, please let us know and we will do our best to rearrange the schedule as we want to make sure your property looks great! Right now we are continuing to focus on pruning. 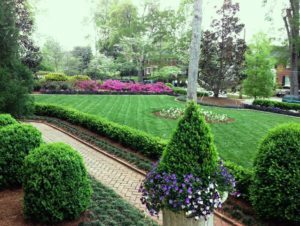 This time of year we will be cutting back roses, some crape myrtles, ornamental grasses, perennials, and liriope. This is the time of year to do any “hard pruning”. Things on your property getting too big? Maybe they need to be cut all the way back so they can rejuvenate? 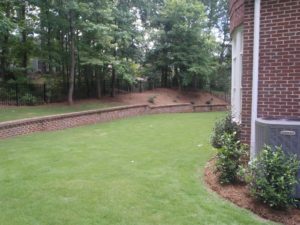 If there are any areas in your yard that you would like to rein back, let me know and we can meet and discuss options. We are noticing some winter cold damage. With the extremely low temperatures this winter, we have seen cold burn on some sensitive plants. A few plants that are more “cold sensitive” are Wax Myrtles, Indian Hawthorne, Tea Olives, Loropetelum, and Encore Azaleas. Most of these plants will recover naturally as the temperatures warm up in the Spring. Some may require extra pruning to help them recover. If you notice brown leaves on shrub or yellow blades of grass in your fescue, it is most likely cold burn. I would be happy to check any plants that you may be concerned about. Speaking of cold damage, all the seasonal color this winter took an especially hard hit from the cold and snow. We will be maintaining your flower beds this month and are making a plan for replacements in the coming months. Fertilizer, pre-emergent weed control, and preventative systemic pest control will all start being applied this month. 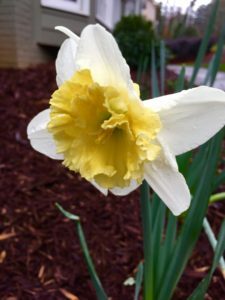 Starting at the end of this month and heading into March, we will be applying fertilizer to all of your ornamental plant material. If we have noticed any plants that need a little extra fertilizer, we will also do that this time of year. We will also apply a pre-emergent weed control in beds to help control warm season weeds. Closer to the end on the month, we will be applying preventative systemic pest control to plants that are prone to attacks or that have had pest issues in the past. 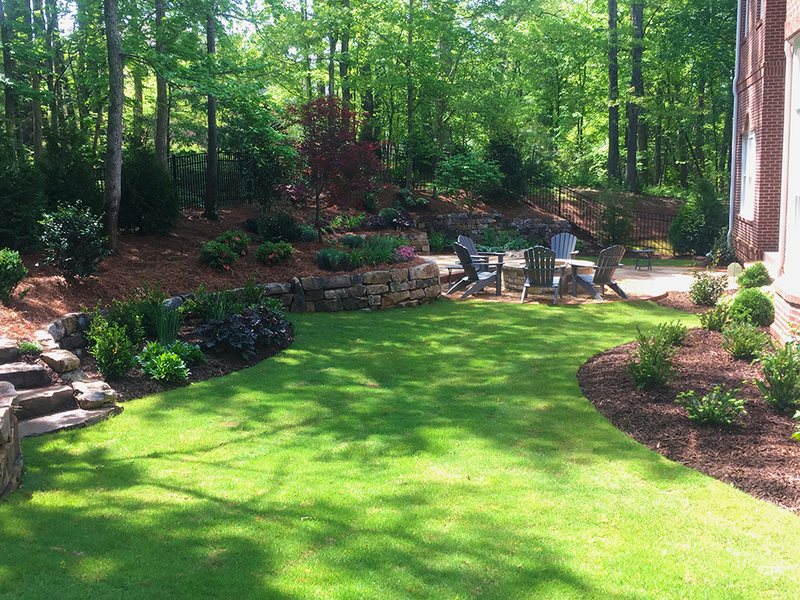 This in an excellent time of the year to put down a fresh layer of pine straw or mulch. Both of these help control weeds, retain moisture around plant roots, and reduce plant stress from extreme temperatures. Please let me know if you would like a proposal! Louisville, Kentucky October 19, 2017 – Scapes is proud to announce it has been awarded an Award of Excellence by the National Association of Landscape Professionals. The awards were presented at a dinner honoring the award winners as part of Landscapes 2017, the annual industry meeting with attendees from across the country. Scapes won the award for “A Tranquil Retreat”. 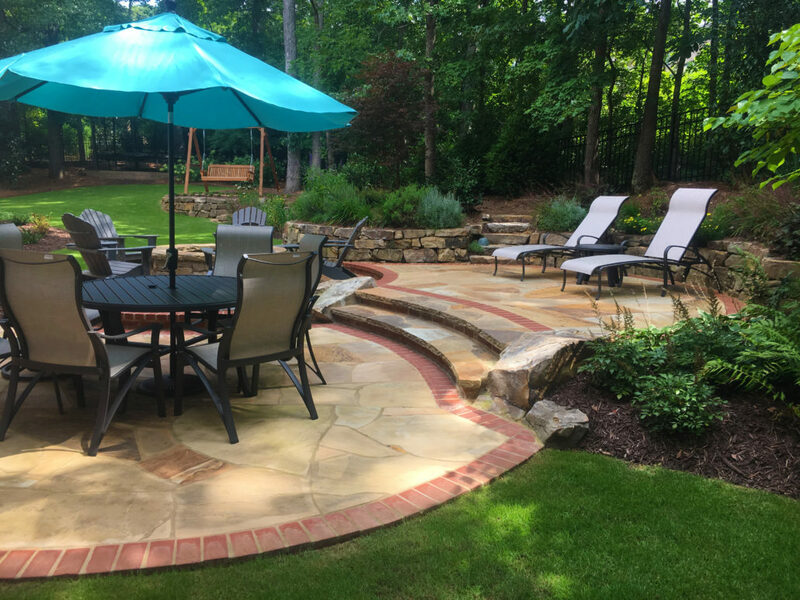 This was a landscape renovation for a client in Alpharetta, Georgia. 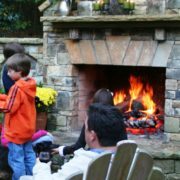 The project entailed the demolition of an existing landscape and the construction of a multi-level patio and entertainment area complete with a fire pit. The renovated landscape better suited the lifestyle of the homeowners. 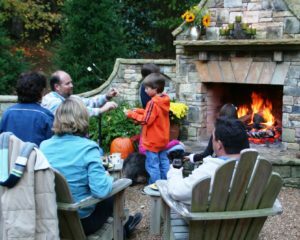 Each year, the National Association Landscape Professionals Awards of Excellence recognizes exceptional landscape, lawn care, and interior plantscape design projects from around the nation. This year, 136 awards were bestowed for maintenance, design/build or contracting projects.